Army Spc. 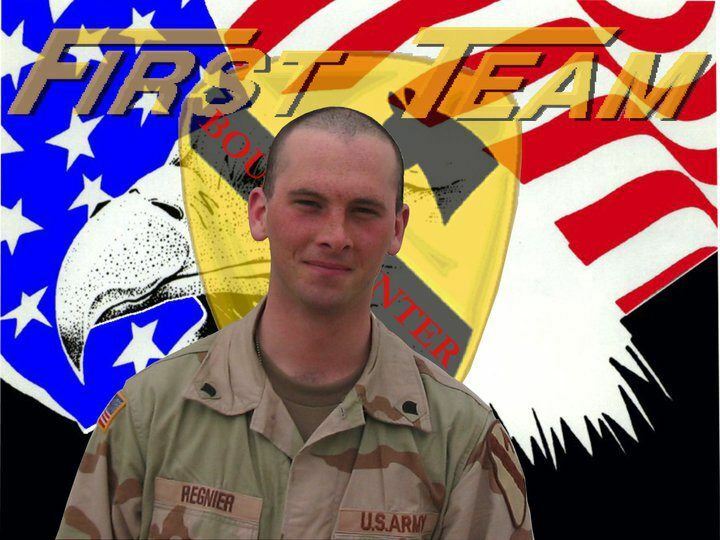 Jeremy Regnier - Run for the Fallen New Hampshire, Inc.
Jeremy called home weekly and had just celebrated his birthday in Littleton in August 2004 while home on a two-week leave. Jeremy joined the National Guard in 2000 and following basic training and a tour in the Guard, he joined the regular Army. Jeremy hoped to become a helicopter mechanic and make a career in the Army. He had dropped out of Littleton High School after the 11th grade, but earned an equivalency diploma while working manufacturing jobs. “He didn’t want to end up on Main Street,” his aunt Judy Ash said. “He wanted to better himself.” Jeremy was a Bradley Vehicle Crewman. He was assigned to various units, eventually joining the 4th Battalion, 5th Air Defense Artillery Regiment, 1st Cavalry Division. He served a tour in Korea, and then deployed to Iraq in March 2004. Jeremy’s family moved to Littleton from Agawam, MA. His parents said they wanted to raise Jeremy and his sister Amanda in a more secure environment. His father owned and ran R&L Siding and Remodeling in Agawam and later became an assistant projects manager there for Six Flags New England. Jeremy worked for his father's contracting business. “When we worked together it was cats and dogs,” his father Kevin Regnier said. “We’re both stubborn.” But he said he shared a tight bond with his son. When his son asked him to go deer hunting once and he said he couldn’t because he didn’t have a rifle, his son bought him one. “He’d give you the shirt off his back,” he said. “He’d do anything for anybody.” Jeremy always told his family not to worry, relatives said. Generations of his family have safely returned from wars, including great-grandfather Wilfred Regnier from World War I, grandfather Edgar Regnier and great-uncle Richard Regnier from World War II, and his father from Grenada, they said. The Caledonian-Record said Jeremy once told his family: “Every Regnier that goes to war comes back. I know I’ll be back.” He had a skull wearing an Army helmet tattooed on one arm as a sign of his commitment to the military. His awards and decorations inlcude the Bronze Star Medal, the Purple Heart Medal, the Army Achievement Medal, the Good Conduct Medal, the National Defense Service Medal, the Global War on Terrorism Expeditionary Medal, the Global War on Terrorism Service Medal, the Korean Defense Service Medal, the Army Service Ribbon, and the Overseas Service Ribbon. Jeremy is survived by his father Kevin Regnier, brother Kip and Nicholas Regnier, sister Amanda Simino and his extended family.